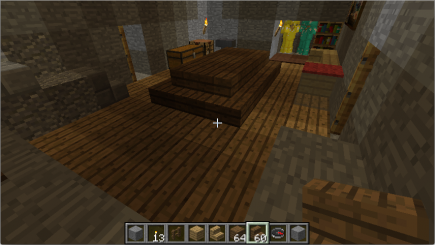 For the April Minecraft session, I wanted to play extend the “band of wood floors” aesthetic that I decided made sense in my cave the previous month. 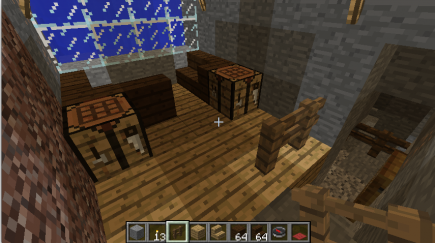 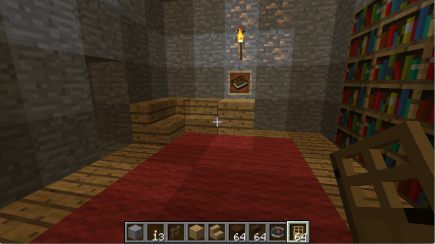 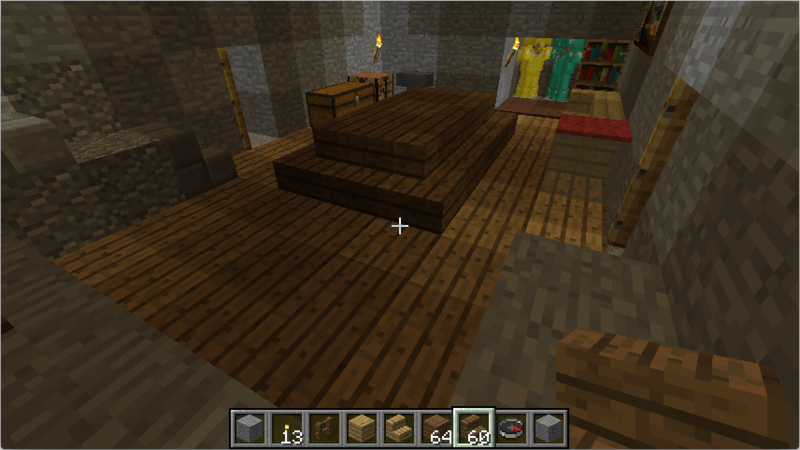 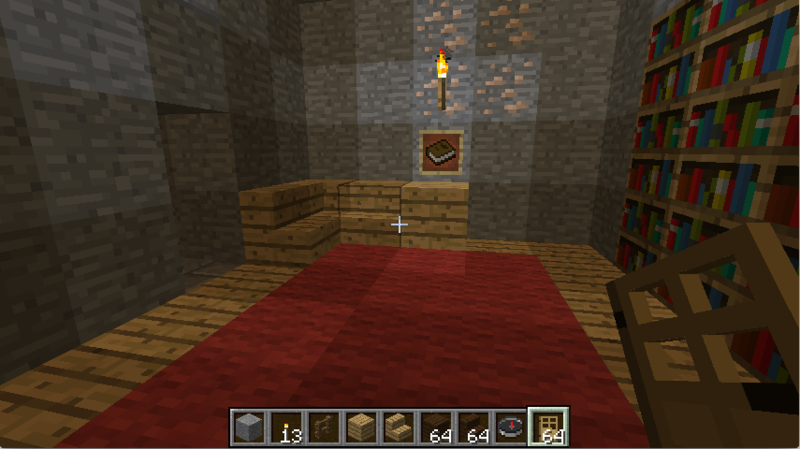 But first I wanted to work on accent colors: the floors are light oak, but other wood should be darker. 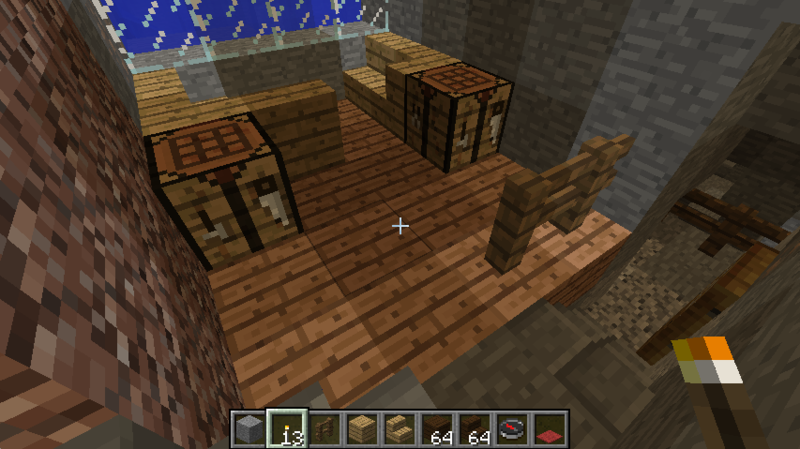 And, in fact, I noticed that I was already (somewhat accidentally) using dark oak for railings. I decided to start by working on a table in the big room that I’d experimented with the previous time: it didn’t seem right, but I think that was because I tried putting in light oak, so I wanted to try again with something darker. 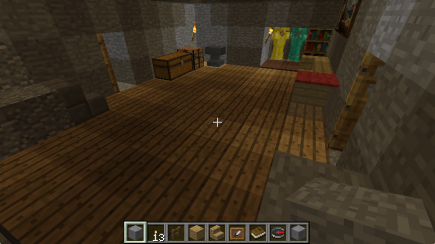 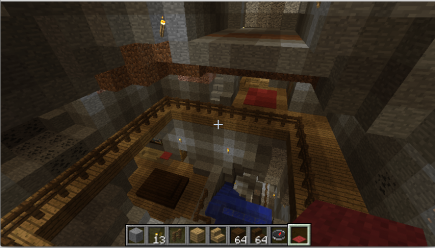 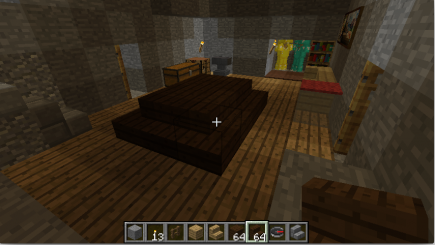 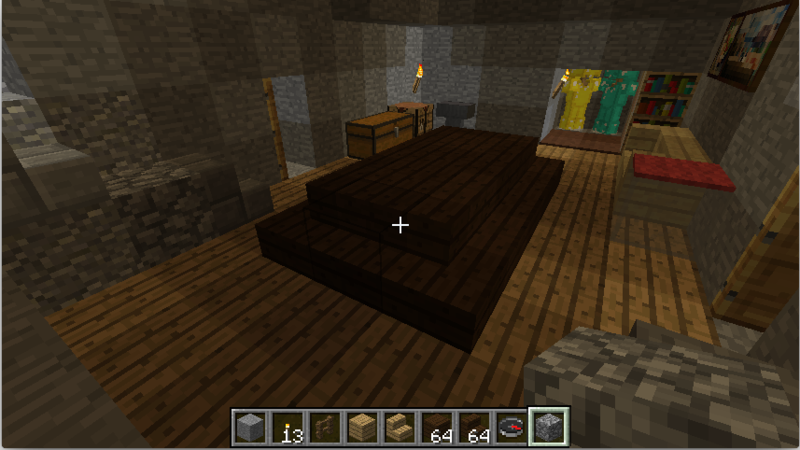 At this point, I thought I had the rules: floors are light oak, railings are dark oak, furniture is spruce. So I went to fix other areas of the cave to match those rules. 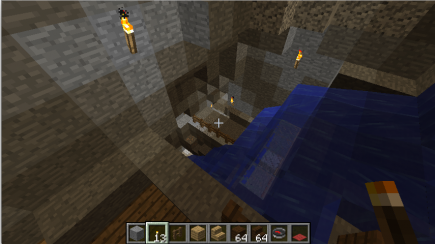 That seemed to work pretty well, now I went around again taking a closer look. 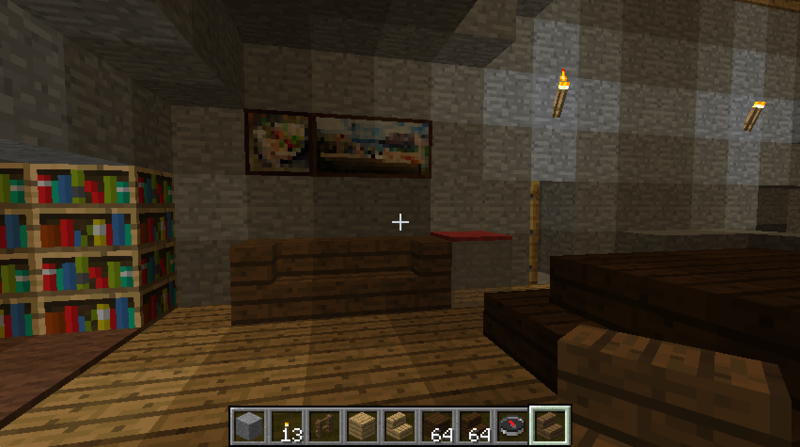 I like that last picture; the next question is what to do next. 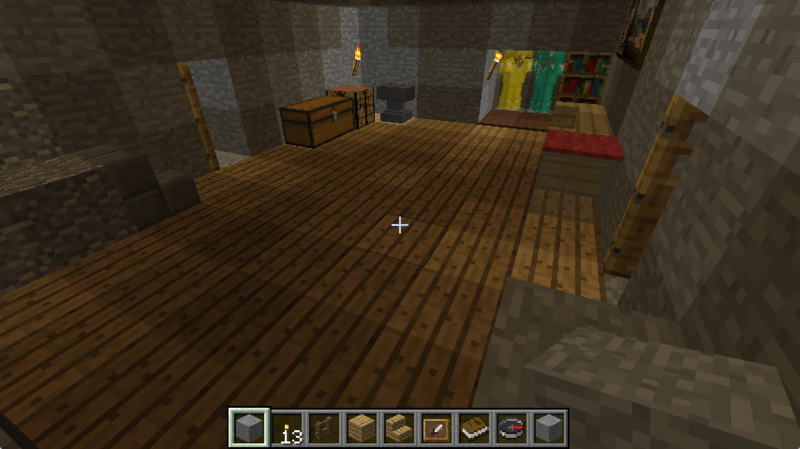 That upper room clearly needs more stuff in it, I should fix that. 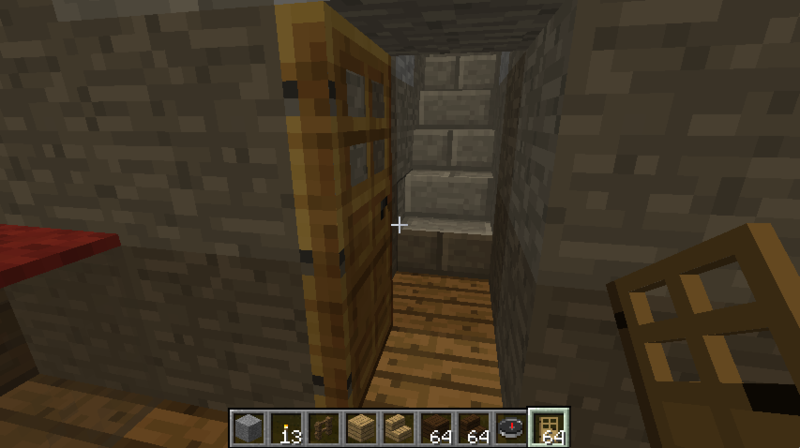 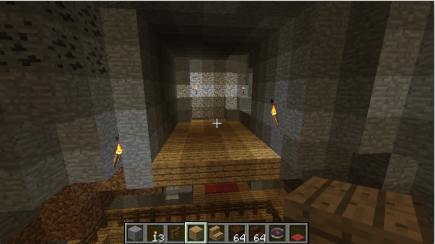 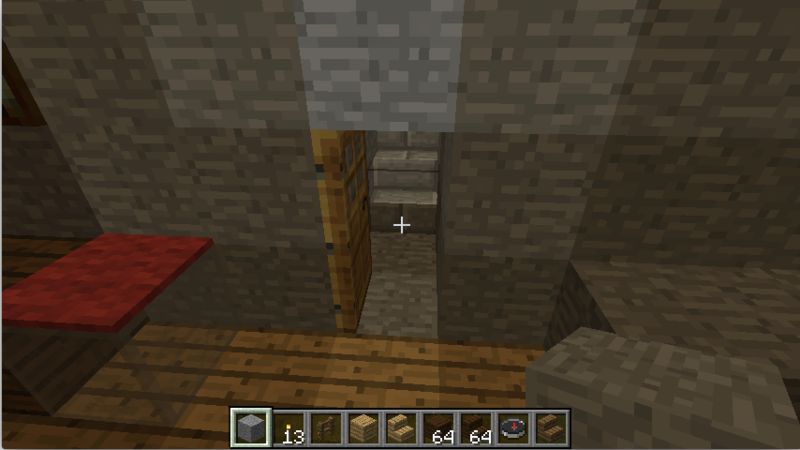 There’s also a passage above it leading to a tiny room (not visible in that picture), maybe I should do something with that? 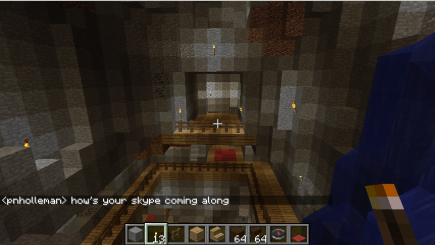 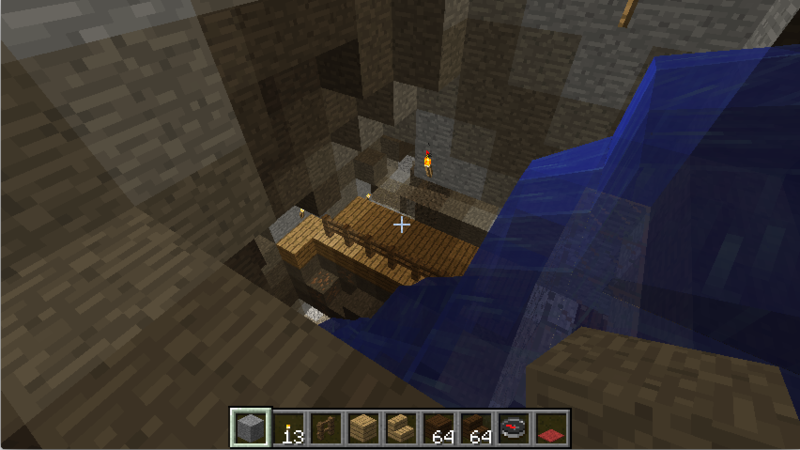 There’s a cave passage on the left (on the level with the balcony all around). 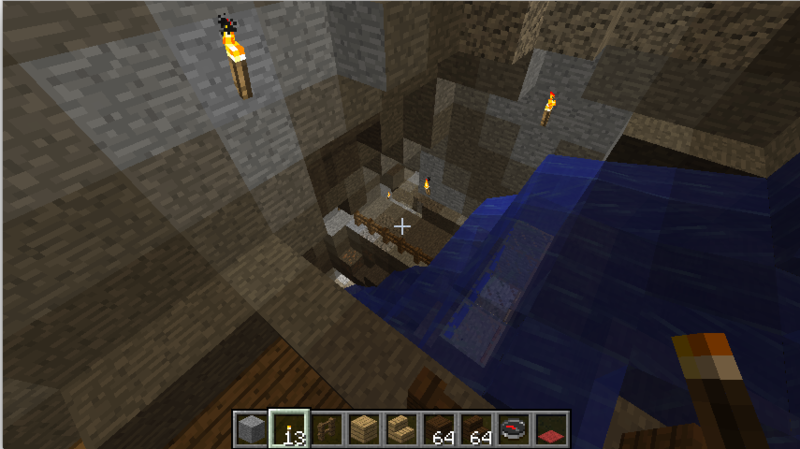 And there’s the unfinished area near the door at the bottom of the waterfall that I mentioned before. So those all seem like possible areas for refinement. I thought about building a door out to the surface there; the question, then, is how far down are we? If I’m remembering correctly, I counted and it was somewhere around 25 blocks beneath the surface, so I’d have to go up a fair amount; I decided to go outside and take a look to see where it would come out. 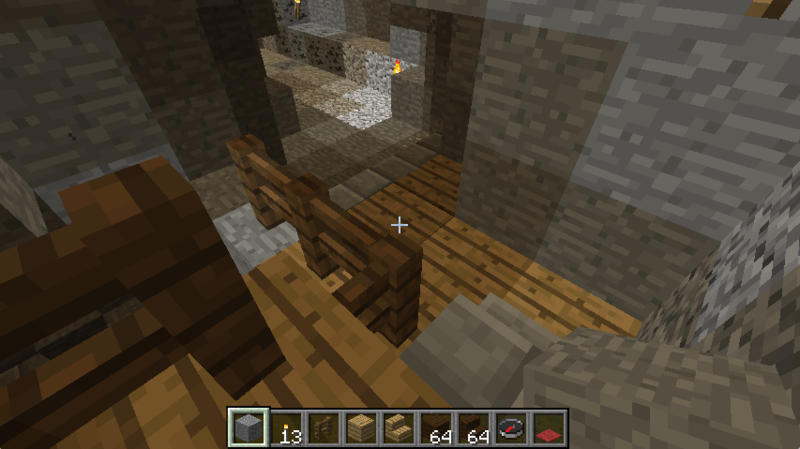 The main takeaway there is that, if I dig back and up at a 45 degree angle, then I’ll have to go more than 25 blocks, because there’s this hill up there that is above and behind it. 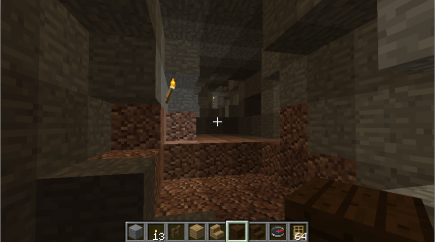 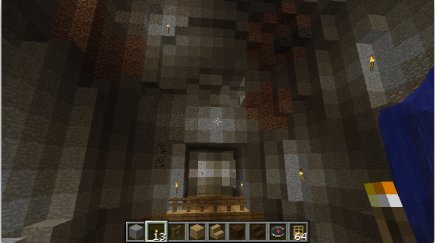 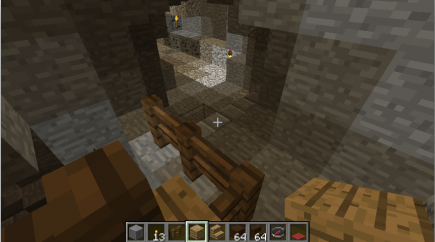 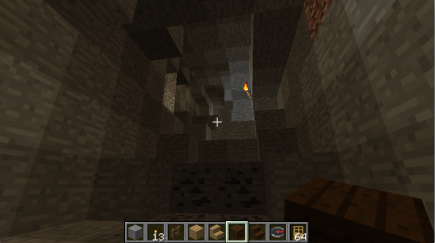 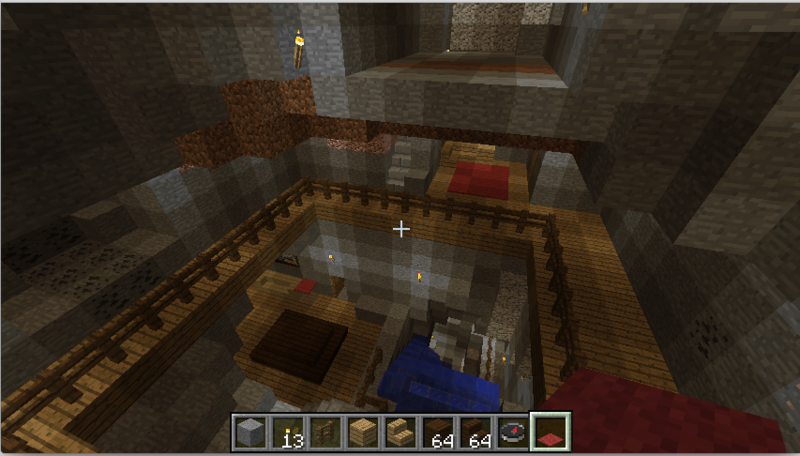 I think that’s still what I want to do, but I might do more surgery there: maybe I’ll hollow out a big area under the cave, like I did with the train station in my first Minecraft world? 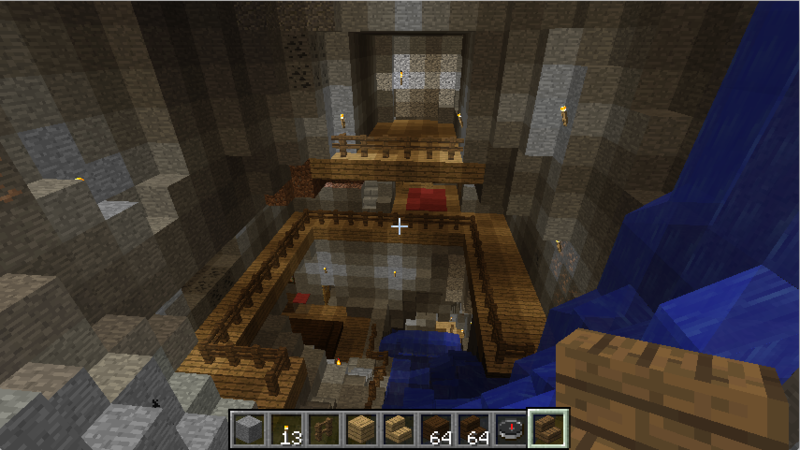 I’m not completely sure yet, but I like how a big structure there would link my cave to Pat’s floating castle. 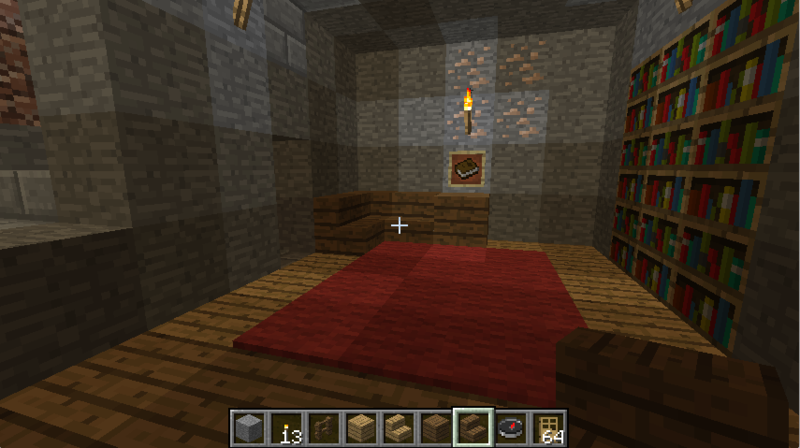 This is the other area that I was thinking about: if you look closely, you’ll see a small opening above the upper room, but, as-is, it’s not really great for a room. 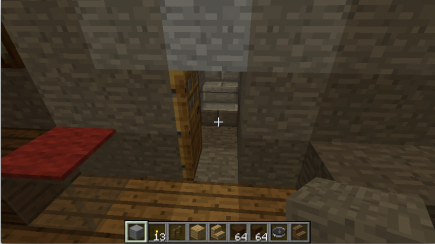 But it’s also so high up that I’m not sure a room there on its own is the best idea, and also having something relatively flat and shallow would work better with the way the wall starts curving in there. So instead, I’m thinking that I might take some inspiration from train stations or cathedrals and think of that as the place where either a big clock or a stained-glass window would go? 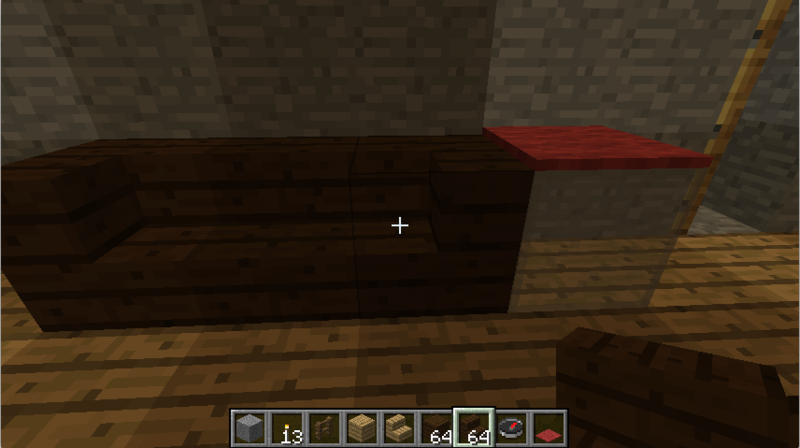 I’ll experiment.